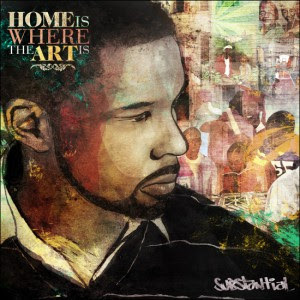 Substantial’s latest album, Home Is Where The Art Is, is a well-executed from top to bottom. With executive producer Oddisee at the helm and a host of exceptional producers, Substantial is a welcome addition to the Mello Music Group’s roster. I’ll be honest, when I found out Substantial was dropping HIWTAI on Mello Music, I was hoping Oddisee handled all the production. However, after giving the album a few listens, I’m glad that he didn’t. While Oddisee does have the Midas touch, including other producers on this project shows that Mello Music Group is bigger than one act and should be recognized as such. The roster of producers on HIWTAI (Algorythm of The Stuyvesants, Street Orchestra, Oddisee, Slopfunkdust, Eric Lau, Surock and M-Phazes) is a definite plus. Hearing how the producers were on the same page production wise made the album sound more cohesive, rather than having an album with a slew of producers with extremely different styles trying to outshine each other. HIWTAI comes off more like a team effort instead of a collection of songs competing to be the best track on the album. With Oddisee as the executive producer, this album has a sound that is fast becoming Mello Music Group’s signature; dope synths, punchy bass and samples for a new school boom bap sound. Substantial is definitely in his element with this production. Lyrically speaking, this album is top notch. Substantial is as hungry an MC as ever and he brought that mindset to the table on each track. The cadence he brings to a song gets you hooked and his subject matter keeps you listening; always a successful recipe. Check out the tracks Check The Resume, See Hear, and Mr.Consistent for a taste of what is one of the better albums to drop in the past few months. As HIWTAI plays through, you might catch yourself waiting for the sub-par track, you know, the one that leaves you wondering why they even put it on the album. Let me go ahead and spoil the surprise, there isn’t one. As HIWTAI plays through, each track has a consistent feel without getting repetitive. Couple that with Substantial’s abilities as an MC and what you have is an album that will get more repeat plays than you might be ready to admit to. Home Is Where The Art Is shows that Substantial has no plans of stopping any time soon. With a new home on Mello Music Group, it seems like Substantial has found a good team with a common goal, to continue providing that good music you never knew you were looking for.